Selecting an appropriate chemical suit for your job can seem like a daunting task. And, with hundreds of options available, it can be hard to know where to start. Now, you might think that suiting up in the highest level of protection is the surest way to keep safe. But, it’s important to keep in mind that the higher level of protection, the less breathability the suit will offer; the less breathability, the more heat stress. So, instead of getting yourself in a hot situation, follow our five tips to help you find the perfect suit. First, it’s important that you conduct a chemical hazard assessment of your workplace. Take inventory of the chemical products that you interact with while on the job. 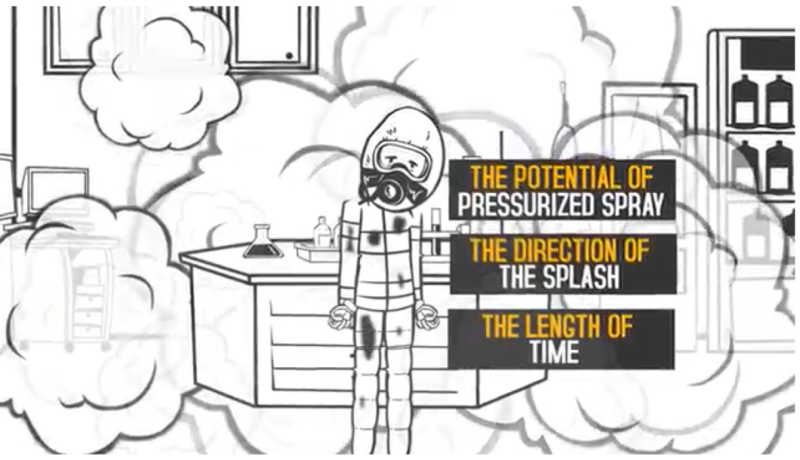 This will help you better understand what level of protection you need in your suit. The best way to do this is by using a Safety Data Sheet, also known as an SDS. These forms include important details such as hazard identification, first aid treatment, PPE requirements and more. Hint: if you have lots of SDS sheets, check out the SafeStation stores and automatically updates all of your documents. How often do you interact with the chemicals you identified? 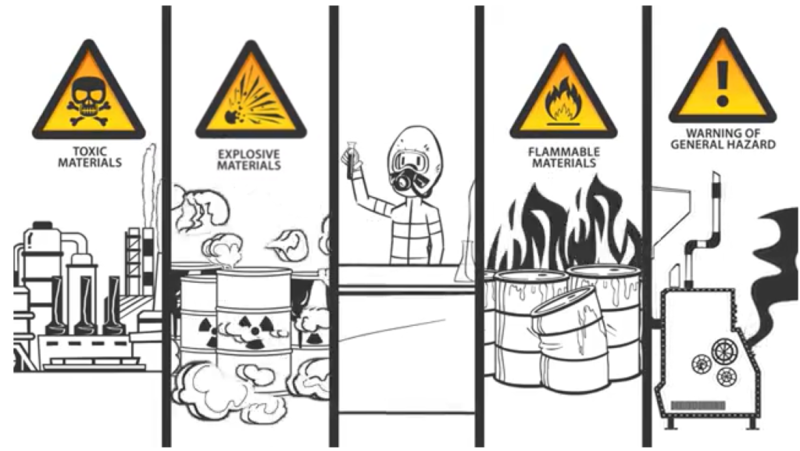 Your hazards assessment should take into account your exposure to each chemical product. You will want to note of the potential of pressurized spray, the direction of the splash and the length of time you’d be exposed. All of these factors will go into deciding which chemical suit will offer the best protection. It’s important to consider the different types of fabrics. From Tyvek® to Tychem®, there are a lot of different options. But, not every type will be a good fit for your work environment. Fabrics are graded by the amount of time it takes for a chemical to pass through its material at a molecular level. This is called permeation. Permeation times will vary depending on the chemical class and concentration. You should note that permeation is different than penetration. 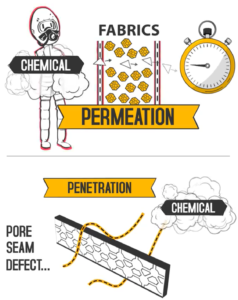 In contrast, penetration happens when a chemical enters a suit through a pore, seam, defect or other opening in the barrier material. In some severe cases, it can even be caused when a chemical burns a hole through the suit. To learn more about the differences between permeation and penetration, check out this article published in Occupational Health and Safety Magazine. 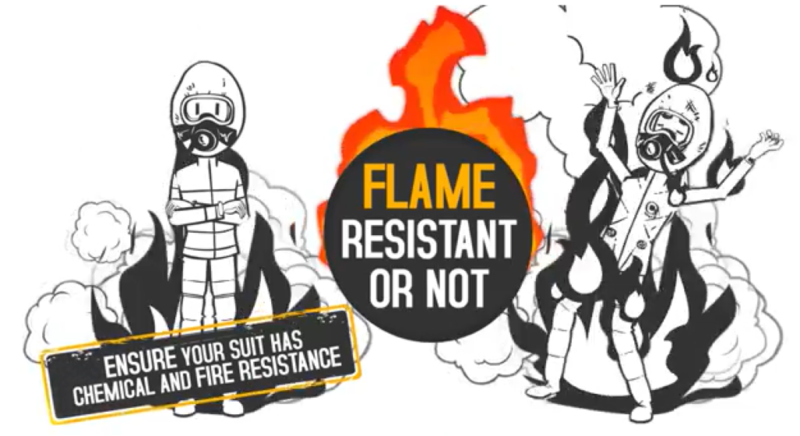 The last thing to think about when considering fabrics is whether yours should be flame resistant or not. If you’re exposed to flammable liquids at any time while on the job, ensure your suit has chemical and fire resistance. Are the chemicals you’re using solids, liquids or gases? Identifying this will make a big difference when selecting which type of seam your chemical suit should have. If your hazards are mostly particulate, then choosing a serge or stitched seam is likely a perfect fit. These seams are constructed using a needle and thread. However, if you’re dealing with liquid or microscopic chemicals, the tiny holes left behind from the stitching can allow chemical liquids to enter the suit. If you’re handling chemical liquids, opt for a bound seam. This type of stitching includes an additional layer of fabric that is stitched over the seam to increase the holdout of solids and liquids. The highest level of protection offered by seams is either heat sealed or ultrasonically welded through the use of tape that covers the stitched seams. This method is completely liquid proof and allows suits to become air tight as the holes from any stitches are covered up. With these sealed seams, the suits can withstand pressurized spray from entering the suits through the seams. Premium chemical suits will also add another layer of this sealed tape to the inside of the seams allowing for even more protection. Manufacturers like DuPont perform testing with different chemical products and fabrics to create an extensive database to help you choose the right chemical suit. 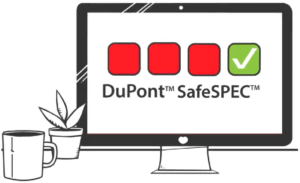 Their SafeSpec program is a great way to determine which chemical fabrics are best for your unique work environment. And, to make things even easier, all of the DuPont chemical suits are available through Levitt-Safety. Either order online or call your local sales rep to help place your order. Just like that, you can find the suit that’s right for your job! The selection of chemical protection suit doesn’t have to be complicated. For any additional help in selecting the right chemical suit for your job, give us a call today.